Things sent to commercial printers need a sort of border around the image called a “Bleed.” A bleed is the part of your design where the image extends beyond where the printer is going to cut the paper. The reason for the bleed is so that if the cut lands a bit off you don’t end up with blank paper at the edges. In Europe there is no standard for business card dimensions. But typically business cards in Western Europe are 85 by 55 mm with a 3 mm bleed all around, giving a final size of 91 by 61 mm. Furthermore, because I am making something for printing on paper, I need to set the Resolution to 300 dpi and Color Mode view should be set to CMYK, View – Soft Proof with Profile – Generic CMYK. Your computer screen uses RGB color mode which, as you probably know, stands for Red, Green, and Blue. On a screen, you are making colors by mixing these three colors of light. White is a mixture of equal parts of all three, while black is the complete absence of all light. CMYK are the four process colors that most printers print with, Cyan, Magenta, Yellow and Key (black). Most other colors can be made using these colors of ink on paper. A mixture of equal parts of all colors yields black. The CMYK model works by partially or entirely masking colors on a lighter, usually white, background. The ink reduces the light that would otherwise be reflected. Such a model is called subtractive. The range of colors you can make with CMYK is smaller than the range you can make with RGB. So when you switch to CMYK, you will find that some things don’t look quite the same. You should switch to CMYK before you send your work off to print. Once the new document is created, the next thing I need to do is add some guides to show where the bleed starts. To make the rulers visible if they are currently hidden, click Show Rulers in the View menu, or ⌘R. Because I’m doing a US card, I have set the rulers to display in inches. To set the units for rulers, right-click on a ruler and select Inches. You add guides by dragging them out from the rulers onto the document. I need a guide about 0.125 inch in from each edge. But, because Pixelmator can only be precise to 0.01 inch, I come in 0.13 inch from each edge. I now have a blank canvas similar to the one below with four guides, each 0.03 inch away from the edge. The image that will serve as the background of the business card will probably need to be resized to be a bit larger than the card and resampled to 300 dpi. I select the entire envelope image, Edit – Select All (⌘A), copy it, Edit – Copy (⌘C), then switch to my card project and paste it, Edit – Paste (⌘V), as a new layer on top. Then with the Move Tool, I adjust the final size and placement of the envelope layer. As mentioned earlier everything outside those guide lines, in the “bleed” area, is just extra material that the printer will cut away. So it’s important to not put anything important near the edges where it will potentially be cut away. In keeping with the envelope theme, I used a postage stamp graphic as the logo. The logo should be placed on the card before adding any text. Having any graphic elements already in place will make placing and sizing text easier. I dragged the stamp image file into the project on top of the other layers. After selecting the Move Tool (V), I scale the logo to an appropriate size and position it where a postage stamp should appear on an envelope. Again, keep the “bleed” area in mind when positioning your content. I add a bit of shadow to the logo with the Styles pallet, View – Show Styles (⌘7), click Shadow, and using the default settings worked pretty well. 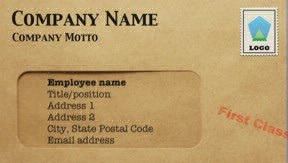 I select the Text Tool (T) and place some text on the card with the company name, motto, email address, etc, that would appear to be on the “outside” of the envelope. I set this text layer to a blending mode of Linear Light and reduce the opacity to about 90% so that it interacts a little with the background. Again using the Text Tool, I add “First Class” in a bold, red font and position it toward the lower right corner. I want to manipulate the appearance of this text layer a bit, so I need to convert it to a pixel layer, Layer – Convert into Pixels. First, I want to rotate it slightly, Edit – Transform…, and grab a corner with a rotation handle. I also want to make it look a little smudgy as a rubber stamp would. I choose the Eraser Tool (E) and select a grunge brush. A few clicks on the text and I have the effect I want. I then place the text with just a bit of it extending into the “bleed” area to make it appear the stamp missed the envelope slightly. Finally, I add a layer of text for the specific user of the card: name, title, contact info: and place it in the “window” of the envelope. To give the appearance of looking through the window at the text, I blur it just a tiny bit, Effects Browser – Blur – Motion, Radius, 2 pixels. Finally, I export the whole project as a tiff format file, Share – Export… . By following the procedure I have demonstrated here and modifying the details to suit your own needs, you should be able to produce a nice, printable business card.